This is a book about punctuation. 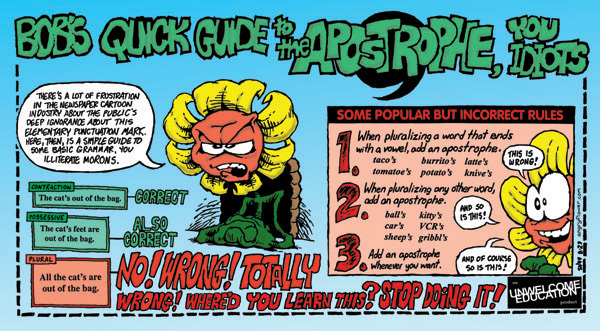 It's written for two types of people: first, for sticklers (like myself) who cringe when we see incorrectly used apostrophes; and secondly, for people who think, "Incorrectly used apostrophes? Whatever does he mean?" For the first type of person, Truss has written a witty manifesto urging sticklers to unite and fight the tide of poorly punctuated e-mail, signs, movie titles, etc., full of hilarious examples and curious stories about the history of punctuation. For the second type, Truss has written a witty instructional booklet explaining in quite simple terms how to use things like colons, semi-colons, apostrophes, and commas, full of hilarious examples and curious stories about the history of punctuation. The problem, as I see it, is that the book is much more likely to be read by the first type (accompanied by knowing nods and grimaces) and ignored by the second (because, after all, who really needs to know the difference between its and it's, right?). Please, if you're of the second variety, take a little time to check out this book: it really is quite funny, and perhaps you'll make the world of writing just a little bit nicer. One thing to note: the book was originally published in Britain, so the rules she explains are not always quite the same in standard American English. However, generally she does point out when those wacky Americans do things differently. And at any rate, if all Americans followed her rules we'd still avoid things like "No Dog's Allowed," and I can't see any harm in that.